This is the second in a five-part series on the recently held Las Vegas Fitness Trade Show. Today, the Octane Fitness Lateral X is featured. The Octane Fitness Lateral X was among the new products that stood out the most at the 2012 Health and Fitness Expo & Business Trade Show held Sept. 19-21 at the Sands Expo & Convention Center in Las Vegas. The No. 1 fitness show in the country annually features the top fitness manufacturers and dealers from the U.S. and beyond. Congratulations to Octane Fitness for changing the fitness industry again when it comes to getting a cardio workout with its new LateralX elliptical cross trainer. 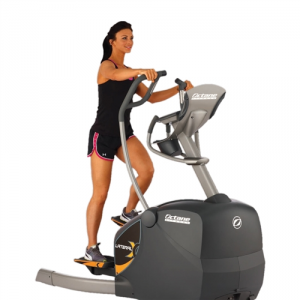 The LateralX from Octane Fitness is the first fully adjustable lateral moving elliptical cross trainer. No other lateral machine been this powerful. The company shows football linemen blocking back and forth, and a basketball player making sudden changes in direction while dribbling, in its video ad for the LateralX. That’s not too far off from what a person can do when exercising on this visionary machine. You can move laterally to fit your needs, or dial in an Octane Fitness program that will adjust the lateral width on the fly after taking into consideration the speed and resistance levels you program. There are adjustable foot pads that can be rotated outward, which creates a side-to-side skating type motion. Or, set it for a more conservative, traditional stepping motion. I really like the way the LateralX adds excitement and challenge to a cardio workout, which can become pretty boring when done the same way day after day, week after week and month after month. It works muscles in different ways and even improves coordination in a cross-trainer type workout that’s sure to create muscle confusion, which is a good thing in the fitness world. Right now this machine is only available in commercial grade and comes at an MSRP of $6,999. I can see the LateralX being popular across the board, but I’d really think people looking for sport-specific training such as the aforementioned football and basketball players would like it, along with skiers, skaters and countless other athletes. Check out the LateralX detail page with photos and videos here.